I MISSED downing semi-skimmed milk back in the UK!!! After the bottle of milk and the carton, now comes the bag of milk. The new containers are being introduced to 500 Sainsbury’s stores in a move that could finally end the 130-year reign of the milk bottle and its plastic successors. Each two-pint container will be priced at 80p, which is 6p cheaper than an average carton. It is designed to fit easily into a reuseable jug, which contains a spike to pierce it open. 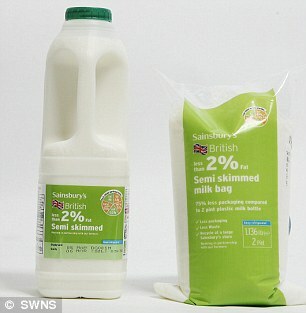 The product uses 75 per cent less packaging than a plastic carton and is easier and cheaper to produce and transport. In fact, switching to the bags could save 1.4million kilos of packaging a year – equivalent to 700 doubledecker buses. Sainsbury’s spokesman Emma Metcalf King said: ‘This is the biggest change to occur to the nation’s shopping habits for at least a decade. 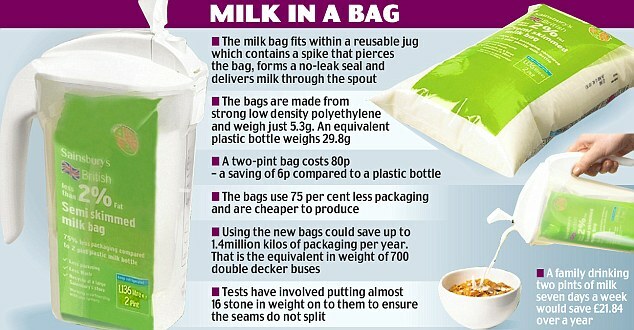 It is not the first time bags have been used for milk packaging, however. Thirty years ago, dairies in Essex tried and failed to encourage them. Havoc was caused by packs which leaked in transit, while shoppers found the bags were punctured by the packaging on other products. More recently, Dairy Crest, the Co-op, Waitrose and Sainsbury’s itself have also run trials. But today’s move by the supermarket giant, which is giving away half a million milk bags to customers in April, follows a successful 18-month trial at its stores. After years of rigorous tests, manufacturers believe they have developed a milk bag able to withstand being bashed about in a car boot or on a crowded bus. And consumers are more likely to take to them this time round because they are far more conscious of green issues such as the carbon footprint, supporters of the technology suggest. Bottles have been the preferred milk container in Britain since 1880 when they were introduced by the Express Dairy Company. They were dominant until the 1970s, before losing favour to Tetra Pak cardboard containers. Britons consume around 180million pints of milk a week. Two-thirds are sold in plastic bottles, which have been the preferred container since the early 1990s. Milk sold in bags is already a common choice for 60 per cent of consumers in Canada, Poland, South Africa and China.